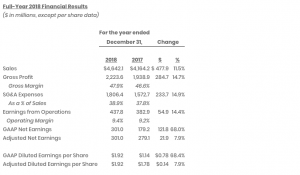 Skechers USA, Inc. reported earnings on an adjusted basis grew 42.3 percent, easily topping Wall Street’s targets, as sales gained 11.4 percent. For the fourth quarter, sales grew 11.4 percent as a result of an 18.4 percent increase in the company’s international wholesale business, a 7.5 percent increase in its company-owned global retail business, and a 4.8 percent increase in its domestic wholesale business. The company’s international business grew 17.9 percent and its domestic business grew 4.1 percent. Fourth quarter comparable same store sales in company-owned retail stores, including ecommerce, increased 1.1 percent, which included an increase of 3.0 percent in its international stores and 0.4 percent in the United States. 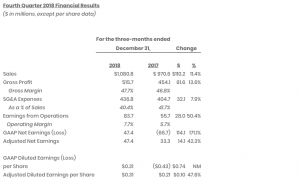 Net earnings were $47.4 million and diluted earnings per share were $0.31. The company’s income tax rate was 18.4 percent. In the fourth quarter of 2017, the Tax Cuts and Jobs Act (“TCJA”) resulted in a discrete income tax expense of $99.9 million, or $0.64 per diluted share. As a result, the company’s reported tax rate was 194.4 percent for the fourth quarter of 2017, and 38.8 percent for the full year. Excluding this discrete item, the company’s tax rate would have been 12.2 percent for the fourth quarter and 12.8 percent for the full year. For the full year, sales grew 11.5 percent as a result of an 18.8 percent increase in the company’s international wholesale business, a 12.0 percent increase in its company-owned global retail business, and a 0.8 percent increase in its domestic wholesale business. The company’s international business increased 19.2 percent and its domestic business increased by 3.5 percent. For the full year, comparable same store sales in company-owned retail stores, including ecommerce, increased 9.2 percent, including an increase of 16.7 percent in its international stores, and an increase of 6.7 percent in the United States. Gross margins improved 130 basis points driven by strength in the company’s international joint venture and subsidiary businesses, and company-owned domestic retail stores. SG&A expenses increased 14.9 percent. Selling expenses increased $23.2 million or 7.1 percent but improved 30 basis points as a percentage of sales from 7.9 percent to 7.6 percent. 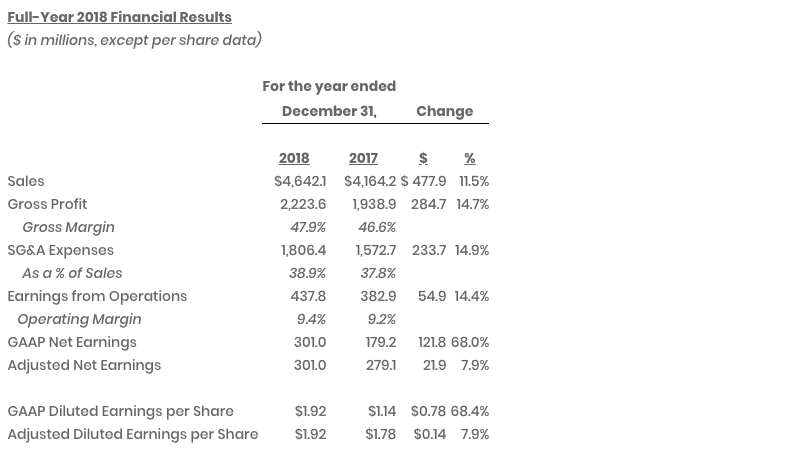 General and administrative expenses increased $210.5 million as a result of the company’s continued commitment to build its global infrastructure and direct-to-consumer channels. Net earnings were $301.0 million and diluted earnings per share were $1.92. For the full year, the company’s income tax rate was 14.0 percent. During the three months ended December 31, 2018, the company repurchased approximately 1.7 million shares of its Class A common stock at a cost of $41.9 million under its existing share repurchase program. In total, the company has repurchased almost 3.7 million shares of its Class A common stock at a cost of $100 million through the full year in 2018. At December 31, 2018, approximately $50.0 million remained available for buying back shares under the company’s share repurchase program. 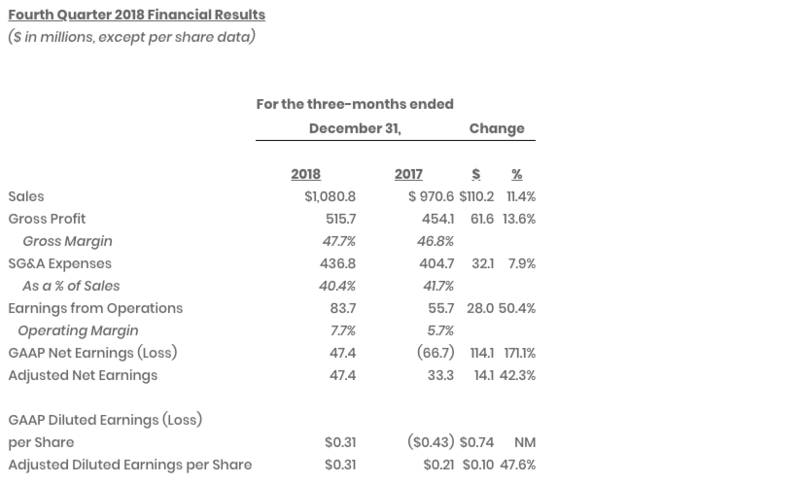 The company will host a conference call today at 1:30 p.m. PT / 4:30 p.m. Eastern Time to discuss its fourth quarter and full year 2018 financial results. The call can be accessed on the Investor Relations section of the company’s website at www.skx.com. For those unable to participate during the live broadcast, a replay will be available beginning February 7, 2019, at 7:30 p.m. ET, through February 21, 2019, at 11:59 p.m. ET. To access the replay, dial 844-512-2921 (U.S.) or 412-317-6671 (International) and use passcode: 13686400.